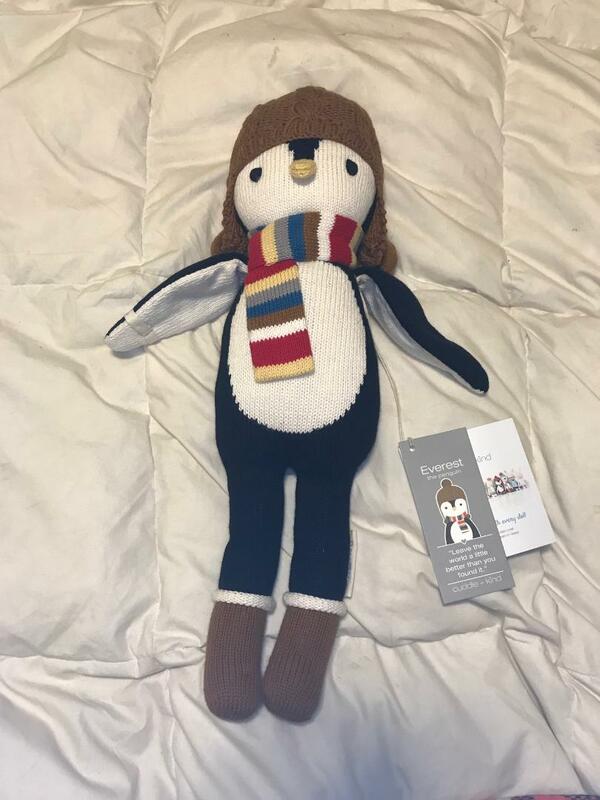 I've heard about Cuddle + Kind in the past, I've always admired their super cute, hand knit dolls made in Peru. Every single detail you see on their dolls has been hand knit, hand loomed, hand embroidered and crocheted by artisans using knitting expertise that has been passed down for generations. They create heirloom quality items and their hope is that their dolls can be passed down for generations as well. 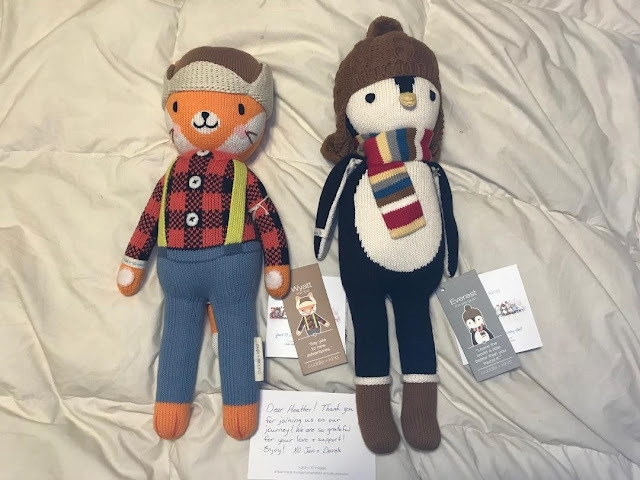 We received Wyatt the Fox and Everest the Penguin both in the regular size. The quality is unsurpassed. You will not find this quality in a regular toy store. They are so thick and well made, all the attention to detail is amazing as well. Each have their own little tag with their picture on the front and a little info. I also received a hand written note from the owners, which I am ALL for. 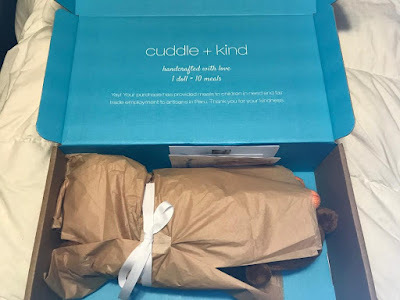 I love personable companies that CARE! Wyatt features an adorable buffalo plaid flannel and overalls. His birthday is October 7th and he comes from the Magnificent Forest where he can roam, run and be free! Wyatt loves to build and fix things with his own 2 paws. His favorite quote is "Say yes to new adventures." Everest features adorable boots and a scarf. They both have a super cute hat on as well. His birthday is September 24th and he comes from the ice and snow which are always sparkling. He loves building snow forts, slurping marshmallows in hot chocolate and helping people. His favorite quote is "Leave the world a little better than you found it." Both of these guys are incredibly adorable, and again, super well made! I love their quality. Cuddle + Kind offers boy and girl versions of most of their dolls (then there's the mermaid, they offer 4 different skin tone/hair colors). And all of them come in a small size (about 13") and a regular size (about 20"). I will share some more of my favorites below. Every doll purchased, gives 10 meals to those in need. I absolutely LOVE a company that gives back and CARES! 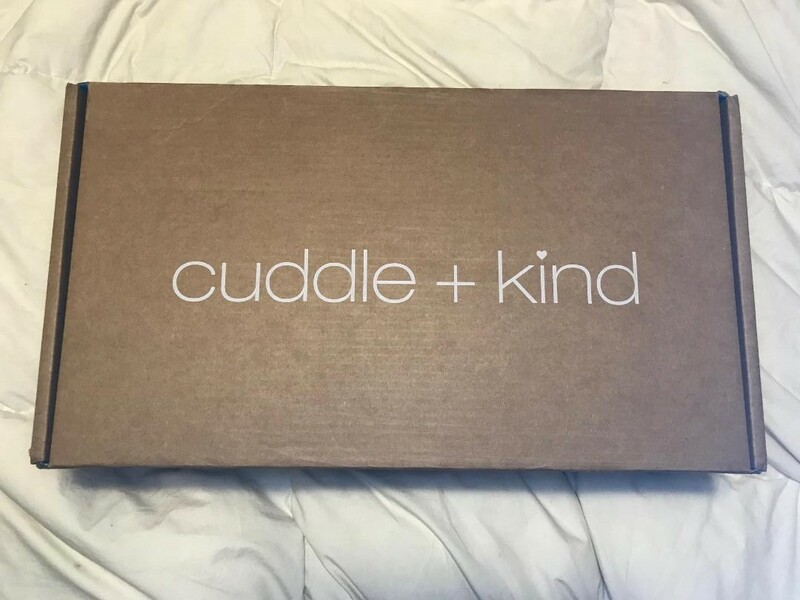 Cuddle + Kind is that company for me. 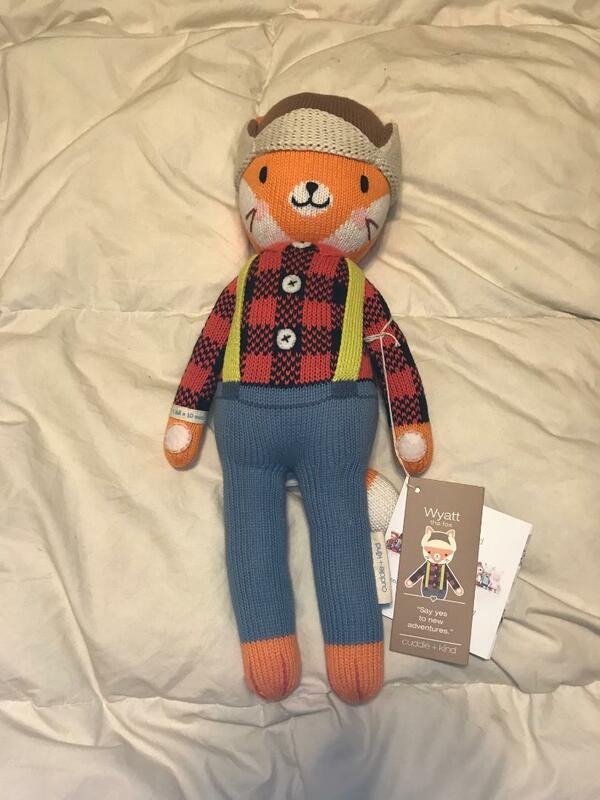 They offer high quality, adorable items, but they also give back. 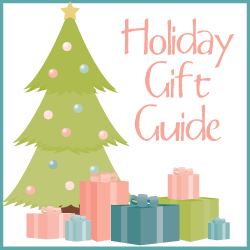 Price: Prices vary for each doll based on amount of details, but they're all roughly the same. The 2 I received are $50 for the small and $70 for the regular. Some are $52/$72 the flamingo above is $60/$80. But they're all roughly the same. I know this seems high, but I promise the quality is worth it. These will not be ruined in 6 months, they will last for years and years and be able to be handed down! AND each one feeds 10 meals, that in itself is amazing!